It’s officially PITCHERS AND CATCHERS REPORT MONTH!!!! For the Cubs, that day is February 14th, which means we’re already less than two weeks away!! Also, today is packing day for the Cubs, which is the day the team loads up all the gear from Wrigley Field and ships it down to Mesa for Spring Training (should be some good videos of the move tomorrow). I seriously cannot freakin’ wait to get back to baseball. Appel is a great guy by all accounts. It is unfortunate that he also ranks as one of the worst No. 1 picks of all time. If he did return and give relieving a try, always a chance he could make the majors, but for now, he's one of three No. 1 picks to not make the majors. 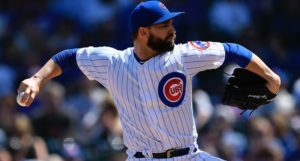 As for the Cubs, I’d rather not play the what-if game for the bajillionth time (especially because it’s a negative hypothetical … so why even bother?). They got Bryant, won the World Series and are expected to be one of the better teams in baseball again. All is well. As I reported on @MLBNetwork this morning, sources do not expect formal @MLB announcement today (at close of owners meetings) on pace of play changes. Discussions continue with MLBPA on proposals. Fortunately, it sounds like discussions between the league and the union are open and active (which is a very real win given the current climate), and a compromise could still eventually be met. And to that end, ESPN has some more details on the previously-proposed compromise, which, if the negotiations really have been re-opened could be something close to a final agreement when all is said and done. Among the newer bits is this: “Teams also agreed on the union’s option that they would make a $100,000 contribution to the union’s Players Trust charity for each minute the average game time in a season through Aug. 31 drops below three hours or make a $500,000 total gift to the players on the teams with the two quickest game-time averages and the two teams with the greatest improvement.” The players of those two teams could elect to keep or donate that $500,000 gift (I suspect they’d probably donate it). In terms of this approach, two things come to mind. First, clearly the league is focusing on the overall length of games and not solely the pace-of-play (which strikes me as an unnecessary, that’s-not-the-point type of move). And second, I do like the idea of an incentive-based approach, which could do a good job of keeping players focused on moving the game along. But I still think the other pace-of-play initiatives should happen. I’m very happy that every team is participating and that I’ve heard very little push back. Those behind the netting will notice for a few moments, and then they will not. And they’ll be safer. Recently, I mentioned that Jeff Sullivan (FanGraphs) was crowdsourcing team win projections for the coming five years, and the results are now in. According to the voters, the Dodgers, Yankees, Astros, Cubs, and Indians, in that order, are going to win the most games from 2018-2022 … Which strikes me as pretty reasonable. Looking at it a different way, Sullivan also compared the last five years to the projected next five years to see who’s on their way up, and, once again, I think fans got it mostly right: Phillies, Astros, White Sox, Twins, Brewers, Rockies, Braves. I’d probably move the Brewers, Braves, and Rockies up, but, all together, that squares with what we believe. That’s a great post, give it a look. Also in a recent set of MLBits, we took a look at some of Brandon Moss’ comments on how the players association has itself to blame for the CBA (and it’s associated flaws), but he recently expanded on those thoughts. But instead of walking back those comments, he stuck by his position: “Everybody wants to look up and scream, ‘collusion.’ Everybody wants to look up and scream, ‘This isn’t fair.’ But sooner or later, you have to take responsibility for a system you created for yourself. It’s our fault.” First of all, this is just one snippet of a long, thoughtful response, so be sure to consider it all. And second of all, I want to point out that I, like Moss, seem to agree that this is both an unfair/unfortunate system for the players and a bed they made for themselves. It can be both, so, again, like Moss, it’s fair to be flexible in your opinion of the matter. 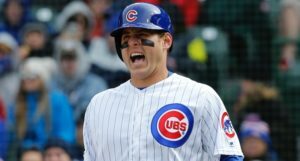 At MLB.com, Andrew Simon uses Kris Bryant’s recent enthusiastic willingness to bat leadoff to show that teams have increasingly been open to batting their best hitters nearer the top of the lineup (including first and second overall). From 1977-2017, the number of “best hitters” hitting in the top half of the order has increased dramatically and it figures to continue as the data shows the benefits. We still don’t know who the Cubs might bat at the top this season – plenty of names have been tossed around – but in all likelihood it’ll be lead off by committee … at least to start the year. SAY HELLO TO YOUR NEW SCOREBOARD! 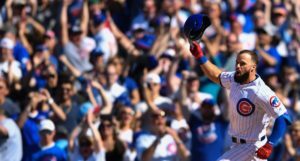 Next Post Next post:Was Albert Almora’s Second-Half Turnaround Against Righties Sustainable?